Friction, adhesion, and wear underlie many engineering applications and these phenomena can lead to significant energy losses. It has been estimated that 2-3% of gross domestic product in industrialized countries is lost to overcome friction, which includes replacement of worn parts. There is therefore a strong technological drive to design materials that have superior tribological properties. However, up to this point such design has been largely empirical because fundamental understanding of mechanisms that underlie frictional dissipation in moving contacts is still limited. Prof. Szlufarska’s group employs ab initio methods and large scale molecular simulations with highly accurate reactive force fields to discover new phenomena that occur in sliding contacts. Our research leads to fundamental understanding of mechanochemistry (i.e., the effects of chemistry on mechanics and vice versa) in frictional contacts and provides a foundation for design of materials with ultimate tribological performance. To reach experimental time scales, we combine atomistic simulations with coarse-graining techniques, such as the kinetic Monte Carlo simulations. Predictions of our models are tested in complementary atomic force microscopy (AFM) experiments (see experimental studies of nanoscale friction). We also develop continuum models, which combine phase field simulations of microstructural with finite element analysis of mechanics to predict how materials evolve during severe plastic deformation on typical experimental timescales. Fig.1: (Top) Large scale molecular dynamics simulation of AFM tip sliding on hydrogen terminated diamond surface. The tip is made of diamond-like carbon and it is also passivated with H atoms. 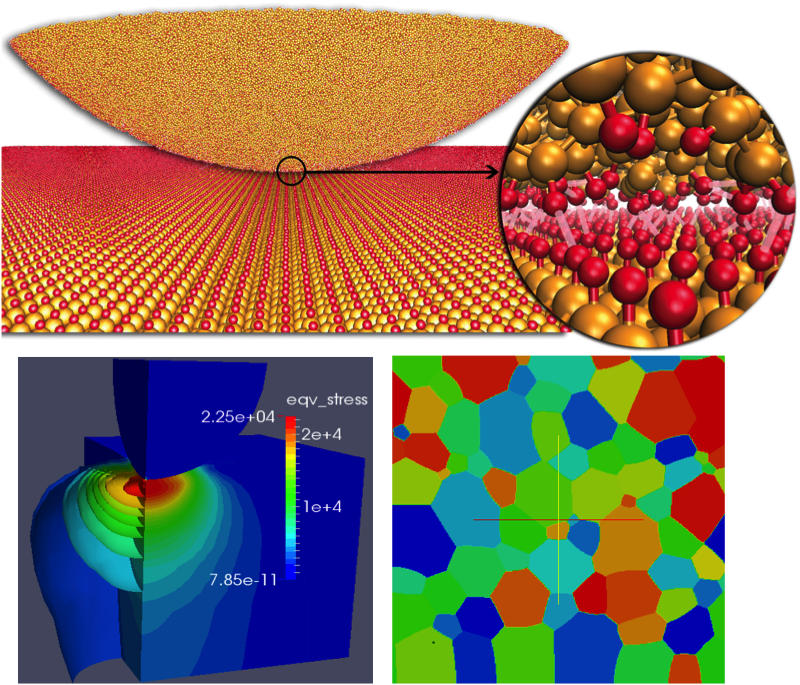 (Bottom) Finite element and phase field simulations of contact mechanics and grain growth in Cu.